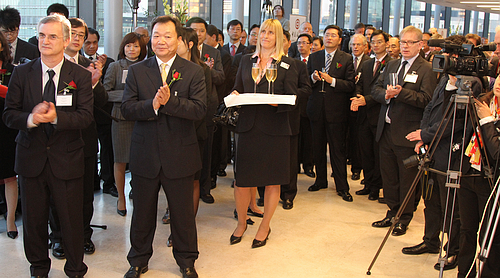 May I warmly congratulate Bank of China London Branch and Bank of China (UK) Limited on the launch of their new office. This is the second such event I attended during my six months in London. The last one was the relocation of the CCPIT London Office early July. 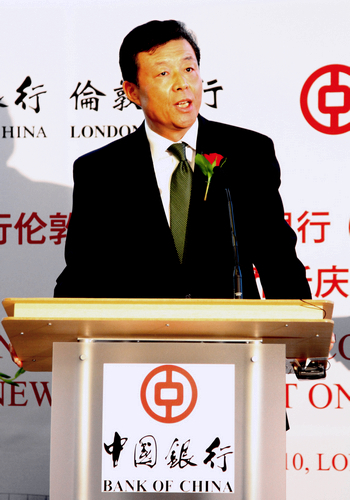 In fact, there has been quite some good news about Chinese businesses in the UK recently. A latest UKTI report ranks China as the 6th largest investor in the UK last year with investments in 74 projects. According to Think London, China was the second largest new investor in London, with 24 companies opened or expanded in London last year. By the end of last year, FDI from China in the UK reached 620 million US dollars. In the financial sector, Chinese banks have set up three branches (Bank of China, Construction Bank of China and Industrial & Commercial Bank of China), one subsidiary and quite a few offices in the UK. I heard that the Agricultural Bank of China are also planning to upgrade its London Office to a branch. This shows that Chinese businesses are increasingly taking the UK market as a big priority and are seeking to leverage London's status as a financial centre to expand their UK and European business. I'm sure there will be more occasions like today and I will be happy to attend. The Bank of China London Branch, which was set up in 1929, was the first overseas branch of a Chinese bank. 81 years on, this branch is brimming with vigor and vitality. First, it has set up offices in the City, London China Town, and in Manchester, Glasgow and Birmingham. Its UK subsidiary-Bank of China (UK) Limited, in particular, has won it access to the EU market. Secondly, it has built a diverse customers' base. The London Branch has cultivated the custom of local Chinese communities and businesses by actively supporting them in their UK ventures with financial facilities. Thirdly, its work force is increasingly local and international. Local professional have been attracted by its inclusive culture and good prospects. 90% of the over 200 employees are British, of whom many are mid-level or senior managers. Fourthly, it enjoys expanding business. With a solid business strategy, a nearly zero non-performing loans ratio and abundant liquidity, it survived the financial crisis well with more equity and a successful acquisition. Today marks a new milestone in the history of the Bank of China London Branch, as it moves into its spacious, well-furnished new office in the centre of the City. I hope that along with this improvement in hardware will come even better services, higher quality management, more customers, a larger talent pool and higher profits. To conclude, I wish the Bank of China London Branch and Bank of China (UK) Limited greater success and a bigger role in China-UK trade and financial cooperation.